The BBC have released the synopsis for the final episode of Doctor Who Series 9, Hell Bent – read it below. WARNING! There be spoilers ahead! Doctor Who, Hell Bent airs 8pm – 9.05pm, Dec 5 on BBC One. In a recent interview, Steven Moffat revealed that there are cameos for returning monsters and it also features Ohila and the Sisterhood of Karn, and “many more”… Read HERE for more info. ummm wait that background looks VERY familiar…. 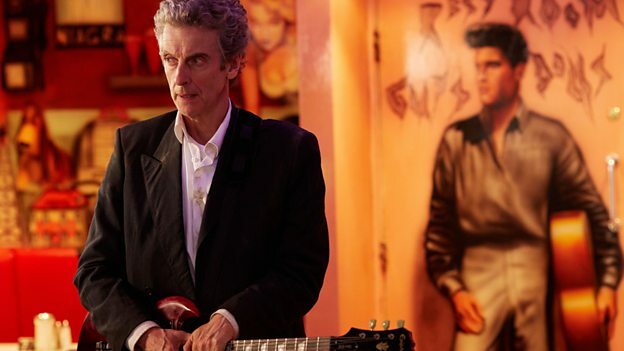 is he in that diner that was from the Impossible Astronaut episode….??? There has to be a link,in the trailer it shows a scene of a truck driving in a place that looks like utah from the impossible astronaut. There's a hand reaching out in that trailer that looks very like Tennant in "Fires of Pompeii." I think we may well be linking back to that original rescue. Was the Doctor fobwatched in Ancient Pompeii for his own safety? Hiding in plain sight perchance? Me (a name I call myself).. yes Her….